Bellydance Restaurant Style! Diners enjoy your delicious meal while different dancers perform throughout the evening in enchanting costumes to delightful music. Chefs may choose between offering the regular menu or specialty items. Jeylan and friends are available for special events or or recurring regular ones designed to build clientèle and community! Please e-mail Jeylan or view her promo kit at GigSalad to set up a night of family friendly entertainment! Upcoming birthday, anniversary, or retirement? Give something to remember with a Bellygram or shimmer and shine with an Arabian Princess Party! Jeylan will provide a beautiful and exciting belly dance in cabaret costume as well as get your guests moving and grooving. For family-friendly settings on the Hampton Roads Peninsula only. Prices start at $100; advance notice is required. For booking info for your next party or social gathering please e-mail Jeylan or view her promo kit at GigSalad. Click here to enjoy a variety of photos of Jeylan over the years. Costumes vary from traditional cabaret to adventurous holiday themes. Click here to see a Stage Performance Video on YouTube of Jeylan performing at the 2019 Queens of the Universe Spring Hafla as a guest instructor. Click here to see a Restaurant Video on Facebook of Jeylan and a happy patron dancing at a Halloween restaurant show. Thanks to everyone who participated; we raised $310 for LINK of Hampton Roads! Bring out your inner Queen of the Desert! With over a decade of experience teaching bellydance to adults and teens and a Masters of Teaching degree, Jeylan is a great choice to lead both regular weekly sessions as well as special event workshops. Are you new to dance classes and don't know where to start? Do you have dance experience and would benefit from a new perspective to improve your presentation? Would your office mates enjoy an activity that takes them outside the box while providing healthy exercise and fun? Jeylan is available for private coaching and classes by appointment. 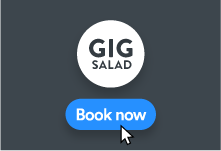 Please e-mail Jeylan or view her promo kit at GigSalad for more information. Sweet Class: An easier paced class for beginners, those with chronic pain, and those who want to focus on correct body alignment as they move through both traditional and modified isolations and movements. Spicy Class: A faster paced class for those with dance experience who are looking for exercise, camaraderie, accountability, and/or practice in traveling, combinations, improvisation and choreography. REGISTER HERE for classes online (preferred), complete a printable paper form, or contact Jeylan to receive printable or printed forms. Paypal preferred, cash and check also accepted. Wear something comfortable in which you can most easily move, preferably which allow the instructor to see your hip and knee alignment (so not big, billowing skirts). This could include exercise wear, leggings, tee-shirts, or running/bike shirts/bottoms. You may dance in socks, ballet slippers, dance sneakers, or other shoes which allow easy movement and provide support. Hip scarves are encouraged but not necessary; the instructor will often have a few to lend during class. If you are unsure about something, please do ask - we want you to be comfortable! Jeylan comes from a performance family and has a background in jazz, ballet, and tap dance. In 1994 she began her study of Middle Eastern dance and fell in love with the rich cultural motivations behind the dance. As a chronic pain patient, she found that the required isolated movements of the dance are both easy on the joints as well as strength building. After a wonderful seven years as a member of Caravan East Middle Eastern Dance Troupe she moved on to become the founder and Artistic Director of Treasures in the Sand Mid-Eastern Dance Troupe which has been performing since 2005. As a supporter of continual education Jeylan strives to learn about dance from many resources. She received her Master of Teaching degree from the University of Virginia in 1994. 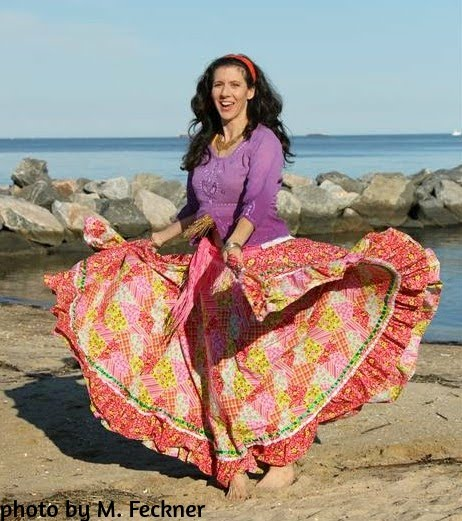 With more than a decade of experience dancing in restaurants and teaching children through adults she finds that she continues to enjoy sharing the health benefits, history, and delight of Mid-Eastern dance. Directed by Jeylan, Treasures in the Sand is a family-oriented troupe which performs a variety of styles including traditional bellydance as well as Middle Eastern folk dances. We love to get the audience up and dancing with us and will happily teach you how to cheer your favorite dances with a "zaghareet"! We are available on weekends as well as some times during the week, and enjoy visiting festivals, retirement communities, schools, and special events. We always wear colorful and appropriate costumes. Consider us when looking for animated entertainment! Keep in touch with the troupe for information about our annual BELLYDANCE BARGAIN BAZAAR & HAFLA as well as The Evening of Treasures and Casbah DINNER SHOWS held in Newport News. To request a booking or more information please go to our Treasures in the Sand website. To see up to date info about performances and fun discussions about dance don't forget to "Like" Treasures in the Sand on Facebook! Members will learn, memorize, and practice an easier paced routine, usually a simple choreography. It may include props such as veil or cane. Members will learn, memorize, and practice a more challenging routine, usually a more complex choreography which may include some improvisation. It may include props such as zils, veil, cane, or sword. Participation in troupe rehearsals is by invitation only and includes participation in quarterly dues and a minimum of 4 performances per year. Schedule an audition or join one of Jeylan's classes now! We are looking for new troupe members to join us in our love of presenting theatricalized Mid-Eastern folk dance and bellydance through community outreach. We particularly enjoy performing at assisted living and rehab venues and embrace the idea of bringing smiles to those in need. Members are expected to perform at an intermediate level or higher, present themselves professionally, and be available for Monday evening rehearsals and weekend performances. Auditions are by appointment and require preparing and performing for the troupe a 3-5 minute Mid-Eastern dance. For more information about auditions, troupe membership, or to request our troupe guidelines or mission statement, please e-mail Treasures in the Sand. Might you be our newest Treasure? Email and texting are the best ways to get in touch! Click here to visit Treasures in the Sand or Like us on Facebook. Based in Newport News, Virginia and available throughout the Hampton Roads Peninsula.